My first ever computer was a laptop powered by an AMD SX-25 CPU running the MS-DOS 5.0 operating system. More importantly DOS 5 included 2 games programmed in BASIC: Nibbles and Gorilla, which were the first computer games I ever played. I hadn’t thought about this at all for many years until I was chatting with some technology journalist friends and the conversation turned to the first games we’d ever played. 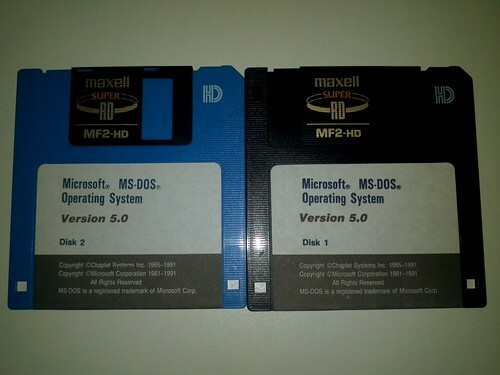 When I reached home that night I found the original MS-DOS 5.0 installation disks so I could take a photo of them. The first commercial games I played were Stunts by Broderbund and Dune II by Westwood Studios. Stunts certainly wasn’t realistic but the game offered a great soundtrack, sound effects, excellent control of your car, replay mode to relive huge crashes and a secret track editor so you could create your very own tracks with all the features you wanted. In the early 1990’s I remember one of the kids down the street bought the new SNES (Super Nintendo Entertainment System) so that was the first games console I ever played on. Obviously the first game I played on the SNES was the classic Super Mario World but I can’t remember the name of the 2nd game, all I recall was that it involved helicopters on a mission flying up the screen. In early 2009 Good Game had a look back at the SNES. Whether you’re a young or old gamer … serious or casual gamer … I suggest you watch Good Game, a TV show made by gamers for gamers broadcast by Australia’s ABC TV but also very popular with online viewers. What was your first computer game and what features did it have that you recall fondly? Ones I created myself in BASIC when I was around 9, and cassette tape was the only recording medium available. Ghosts and Goblins, Gauntlet,Test Drive, Boulderdash, Barbarian all on the C64. Good times. OMG Nibbles was the best!! Well, as i recall, the first video game I ever played was a simple device that you plugged into the TV. It was tennis. It was incredibly simple. There was a white bar down the middle of the screen defining the two sides of the court and then two shorter white bars either side representing the players/raquets. Then a small white cube representing the ball. It all moved soooo slowy. The ‘players’ could only be moved up and down. And that was it! I thought it was fantastic and fondly remember the ‘beep’ noise that was triggered by the ‘ball’ making contact with the ‘raquet’. Seems ridiculous now but it was well over a quarter of a century ago! I didn’t own a PC or game console until ’99 but about 10 years before that in high school we were playing Pac Man and writing our own Choose-Your-Own Adventure type scenarios in BASIC. My high school had one computer room and we were 2 or 3 to a console. I kept my old floppys too for many years- may still have them somewhere in a box. We also mucked around with a very simple graphics program, similar to Paint and I remember sourcing sheet music for Madonna songs so we could put them into some music program that played them back in the most terrible, tinny sound imaginable! one of my first games was on the old nintendo, stupid thing alwas froze up, but the old mario ruled. I’d have to say though, that “Bonks Adventures” on the Turbo Graphix16 was priceless lol. My first game was PONG, ancient! Excellent trip down memory lane, spent many hours playing stunts.